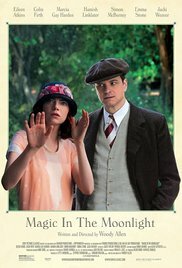 NEW YORK (October 15, 2013) – Woody Allen’s new film is titled Magic in the Moonlight. Set in the South of France, it stars Eileen Atkins, Colin Firth, Marcia Gay Harden, Hamish Linklater, Simon McBurney, Emma Stone and Jacki Weaver; and co-stars Erica Leerhsen, Catherine McCormack, Paul Ritter and Jeremy Shamos. The Gravier Productions film is produced by Allen’s longtime associates, Letty Aronson and Stephen Tenenbaum. Allen’s latest film, Blue Jasmine, is currently in theatrical release through Sony Pictures Classics.